You want colorful t-shirts... you've got it! Seven Colors to be exact. Purple people too! Every sport imaginable is printed on the shirt. It has the jump rope, crunches, soccer, basketball, track. Where's the hockey? Broom ball? Maybe on the next rendition. Can you see the letters, though? If you are having trouble, then stand back a bit and squint your eyes. This shirt was designed by the talented V....Vaughan. Ink Color: too many to list. 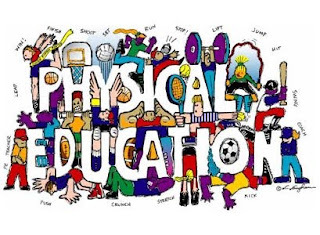 Brand: Physical Education Shapes is printed on a Hanes Tagless 6.1oz T-shirt.